What are the projected dates for Greenville, Maine peak foliage season? Mid September to early October. Are there areas, vistas, scenic lookouts or other destinations within Greenville that are known for their uniquely beautiful autumn foliage displays? The Katahdin, a restored steamboat runs leaf peeping excursions on Moosehead Lake, Tuesday-Saturday, departing Greenville at 12:30 pm MT Kineo in the middle of Moosehead Lake has spectacular views from its Fire Tower. A shuttle boat runs over to Mt Kineo from Rockwood 9:00am to 3:00pm.Many of our hiking trails including Gulf Hagus, Borestone Mountain, Big & Little Spencer Mountains and Big Moose Mountain have great views. And as always the view from Indian Hill in Greenville will be beautiful. Leaf Peeping IS the big event of the season. (Editor’s note: Greenville, Maine is a town of 46 square miles with a population of just over 1,600. It is a place you travel to or visit while traveling with a purpose in mind to get away from the hubbub of “too many people”, a place to slow down and take in nature’s quiet beauty, a place where you can support local folks by spreading around a few of your tourist dollars. A bit more about Greenville at Wikipedia). The Moosehead Marine Museum and its restored steam boat, the Katahdin.The Moosehead Historical Society with its great lumberman’s museum and Indian artifact collection. Mt Kineo, the largest mass of ryolite in the United States. Visited by Henry David Thoreau in the early 1800’s. Home of one of the largest inland hotelsin North America in the late 1800’s. 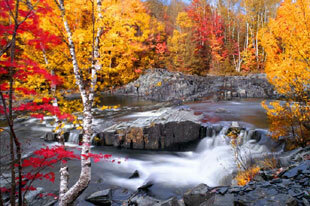 What are some other popular tourist attractions for autumn travelers to Greenville. What are some of the less well known, but much loved local attractions? Moose..moose…moose…rutting season coincides with leaf peeping. Gulf Hagus, one of the natural wonders of Maine, a series of waterfalls andgorges in the middle of the Maine Woods,Greenville with its quaint stores and great restaurants. Our 150 mile loop over three scenic highways. Foliage.org: Are there favorite destinations for history, literature,architecture buffs, or antique collectors? What are they? History: Mt Kineo, Historic Pittston Farm. Architecture: Rockwood, a traditional Maine fishing village. What are some helpful resources for discovering local inns, bedand breakfasts, lodges, boutique hotels, and other local lodging and dining? Moosehead Lake dot org lists the accommodations, dining, shopping and activities, in addition there is a 64 page Vacation Guide available online. Is there anything else you would like to tell visitors thinking about traveling Greenville for the fall foliage season? Great fly fishing in East Outlet and Indian Pond. Special thanks to the Moosehead Chamber of Commerce for providing this informative interview on Maine’s fall foliage.